Iconic US Greyhound coach design. Description: An iconic design from the other side of the Atlantic where the legendary Greyhound network of services is today part of popular culture. Being a left hand drive vehicle the work that this vehicle can undertake on the public highway is far more limited than the rest of our fleet but it is available for film work, promotional uses and as a back drop or photo opportunity. A wonderfully unique vehicle that just oozes the character of long trips on the freeway! General History: Built by MCI who were formed in 1933 and who Greyhound as the purchaser of its vehicles brought out in 1958. With expanding operations the MCI capacity was increased when a New Mexico assembly plant was added to the already busy North Dakota plant. 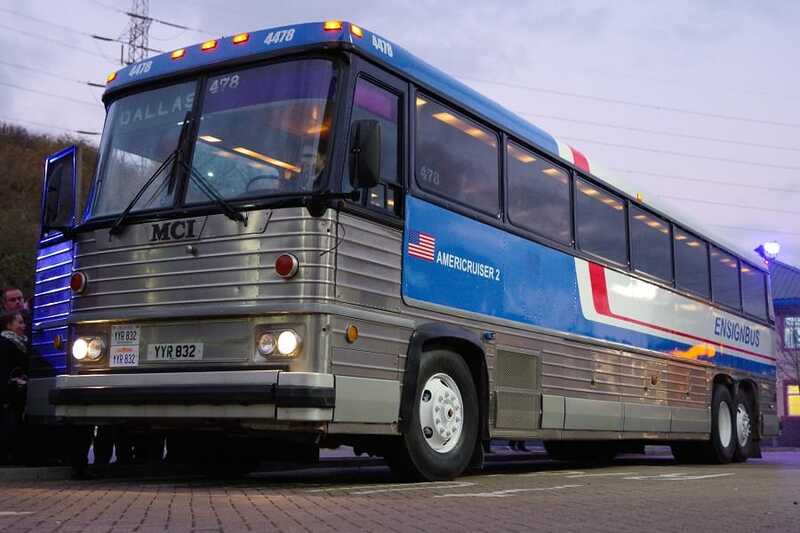 In 1986 the operating and manufacturing parts of Greyhound were split and in 1991 MCI became its own trading entity. 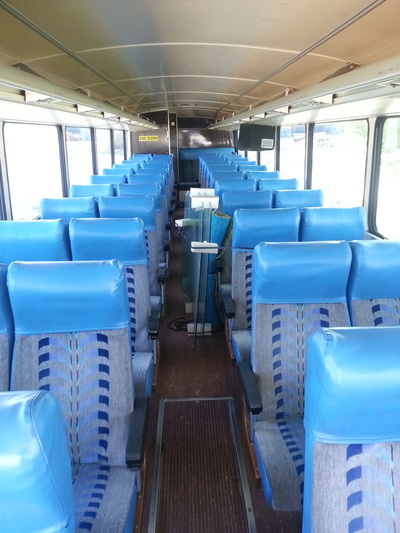 The type of vehicle we have is an MC-9 which is part of the MC series that ran from the MC-1 which was introduced in 1958, up to the MC-12 which was built between 1991-1998 and are the quintessential Greyhound coaches of the USA. Vehicle History: Our vehicle is an MC-9, the type built between 1978 and 1990. Ours came out of the factory in Pembina, North Dakota in 1982 and was destined to spend most of its life based in the southern states of the USA. It was new to Kerville Bus Service in Kerville, Texas which was a subsidiary of Greyhound. From there some years later it passed to Herrera Coaches of Alburquerque, New Mexico. Its next operator was Kraft Tours in Tulsa, Oklahoma where it gained the fleet number 478 and worked as a touring coach until withdrawal early in 2016. Purchased by Ensign in March 2016 to assist with increased film work, it was delivered to Galverston docks in April 2016 and arrived at Southampton on May 31. It gained a UK class 5 MOT shortly afterwards and has already been used in some studio based film shots for forthcoming movies.